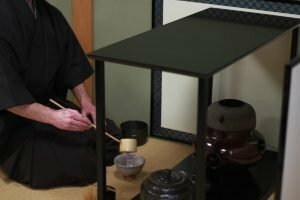 What do you need to know before you attend a tea ceremony? 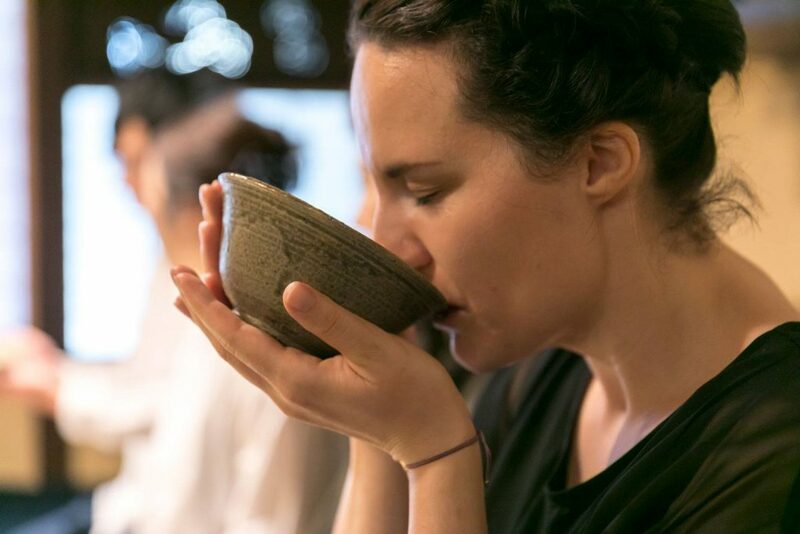 Participation in the rite of tea calls for tranquility, relaxation and peace. You can achieve this through showing respect and deep-felt appreciation for the efforts of your host, the presence of others, and the occasion as a whole. But how do you express such feelings? 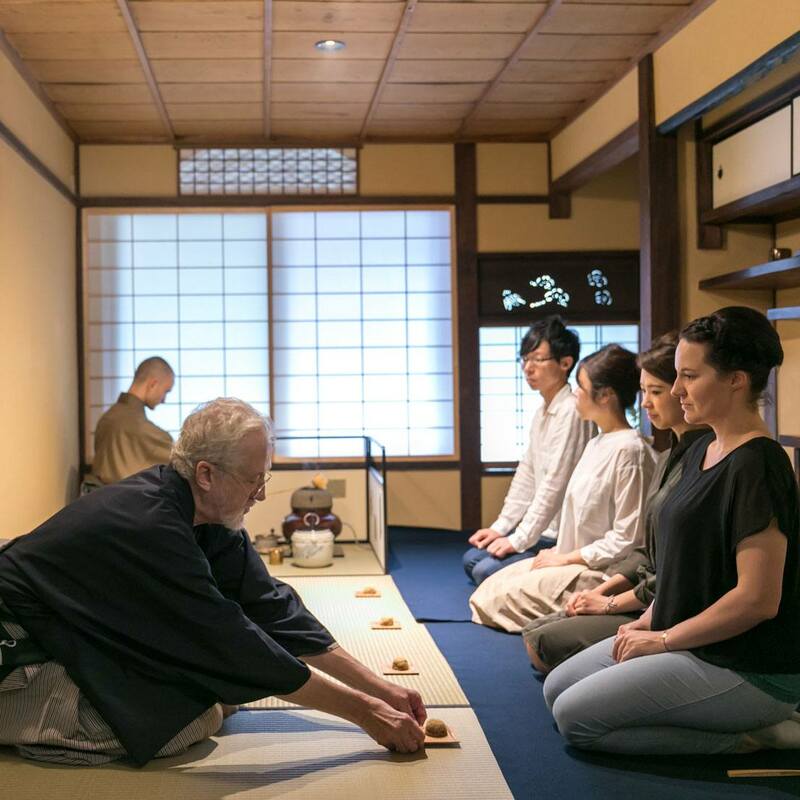 The following tips provide you with an understanding of basic Japanese tea ceremony etiquette that you can apply in any situation. Showing that you are aware of these conventions will immediately set you apart from other participants. But, don’t simply memorize the rules; try to also understand the underlying message and feeling this action conveys and why it bears meaning. It is a sign of respect and thoughtfulness to your host to bring a pair of clean, white socks to change into upon entry. In the past, people wore open sandals to move about outside. This would allow dust and dirt to easily catch onto their tabi socks. It was customary to carry a pair of clean socks to change into when visiting someone’s home. Although our socks are protected by our shoes, and don’t get dirt on them as easily, the practice remains the same. Today, however, it is more a matter of showing respect. White is the purest color, and it will show immediately when it is stained. By changing into white socks, you indirectly convey your appreciation for your host’s care. He/she has cleaned and tidied the place in order to receive your presence. If there is one object that a well-prepared tea person can’t forget it is his/her fan. Opposed to fans that are used to cool oneself in summer, fans for use in the rite of tea are smaller. Moreover, you only use them ceremonially, and never open them. (except for a very limited number of strictly prescribed ceremonial actions). A tea person uses his fan to designate the boundary, and simultaneously to create the connection between himself, and whomever or whatever he/she is addressing. The most common use of the fan is when you are exchanging greetings with someone. 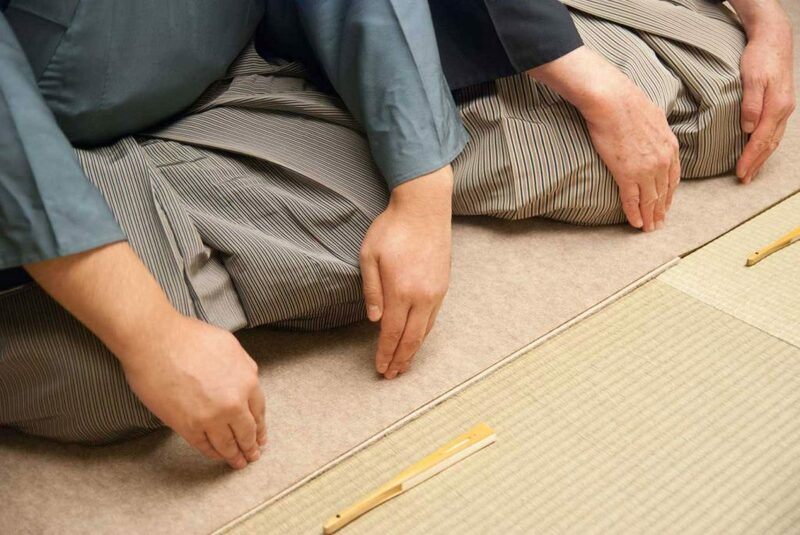 This is part of common Japanese tea ceremony etiquette. Both parties would hold their fan in their hands in front of them when standing, or place it in front of their knees on the matting when seated. Proper use of the fan may require practice to master. For now, try to remember that when someone addresses you and brings his/her fan out to do so, return the gesture. 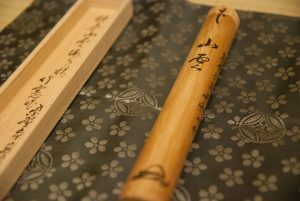 The most important objects in the tea chamber are the scroll and the flowers. They are on display in the alcove. 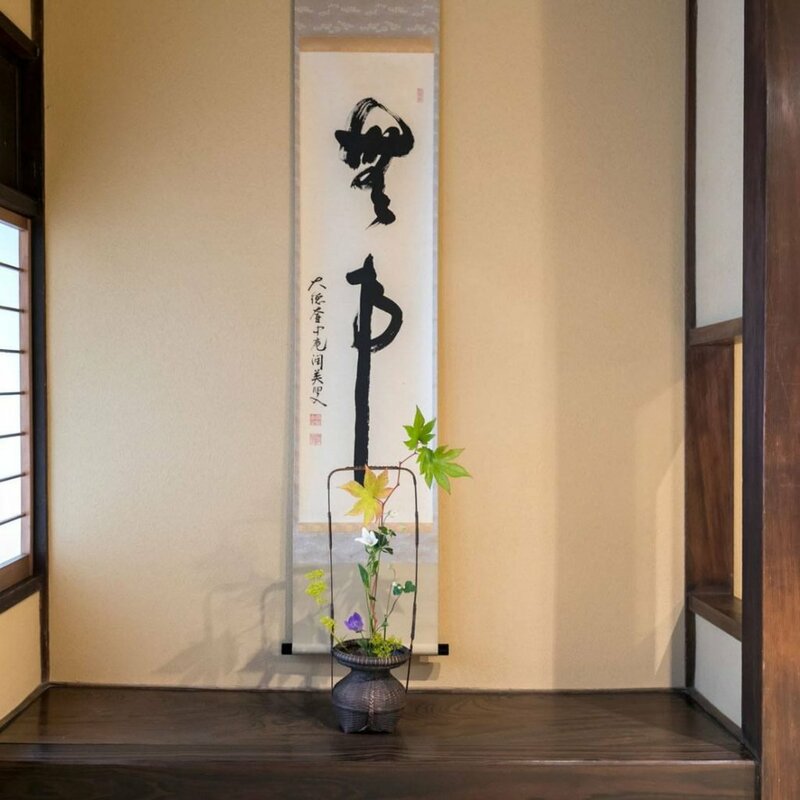 Proper Japanese tea ceremony etiquette dictates that each guest will, before getting to their seats, sit down in front of the alcove, place down his/her fan and bow to the scroll, appreciate it, and then does the same for the flowers. The scroll is the embodiment of the person who wrote it. To pay respect to the scroll, is to pay respect to his spirit and indirect presence in the room. It also sets the theme for the tea occasion. The host has chosen the calligraphy or painting in line with a seasonal trait or specific thought. Therefore, when you can read what it says at this stage, you may already catch a glimpse of what awaits you. The flowers are the purest element in the room. They have been cut from their roots and are no longer able to propagate their species. Therefore, they are free from intention and desire. The host has chosen them as an offering to you, the guests. But they are also a means to purify the atmosphere. Essentially, they are also an offering to the person who wrote the scroll. And some people see them as a representation of the universe as a whole. After having admired both objects, find your seat. When you are accompanied by other persons, try not to sit as the ‘first guest’, but let someone more experienced sit closest to the host. However, also try not to sit last. The last guest often has a lot of work to do. Preferably it should be someone who has had training in the rite of tea. 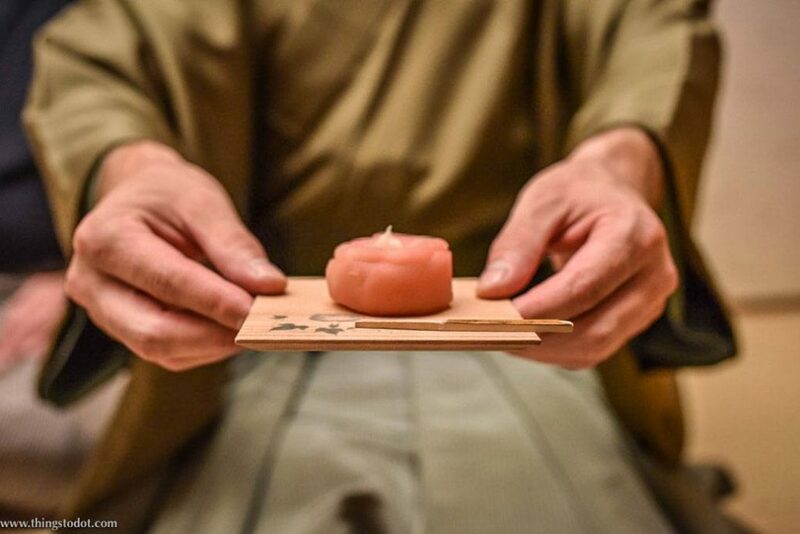 Before receiving your bowl of tea, you will be served with a handmade Japanese sweet. It is proper etiquette to eat it completely before your host serves your tea. Oftentimes you will be provided with a wooden pick to help you with eating. Use it to cut one-third, stab it and eat it. Cut the remainder in half and have both pieces in succession. To receive something in three mouthfuls is ceremonially correct. 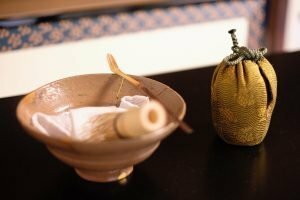 It concords with how a ceremonial serving of sake is received, and how tea is to be drunk as well. To receive something swiftly, and as soon as it has been served is considered good manner when receiving food at a restaurant. Japanese cuisine is delicate, and the chef pays great attention to the temperatures of the food when he serves it. When something is served hot, it should be consumed hot. When something is served cold, it should be savored cold. To let something hot cool down, or to add spice to a dish for example is considered rude to the chef. A bowl of Japanese tea is always presented with ‘the front’ facing you. This means that the most interesting side of the bowl is pointing towards you. The host presents it this way, because he wishes to make sure you, as his guest, receives the best possible treatment. However, it is common courtesy to not just lift the bowl and receive its contents. It is proper to show your respect to the universe for providing the tea, and to acknowledge your hosts care by showing humility. Therefore, the common procedure goes as follows. First, before you lift the bowl, you direct your attention to the guest ahead of you to request permission to join in drinking. Then you also address the guest who comes after you, to apologize for drinking first. In doing so, you are not only being polite, you also acknowledge the presence of others; the very people that are creating this special moment together with you. Then you pick up the bowl and raise it to the universe in thanks. (Read more about the significance of this gesture here). Having done that, you turn the bowl 90 degrees clockwise to avoid drinking from the front. This is a humble gesture that informs the host that you have grasped his intentions; while indicating that you possess enough common sense to save the utensil from unnecessary defilement. Happy to see that you enjoyed the article.